This week it's the Care Quality Commission's #InvisibleDisabilities Week and today, they're highlighting Ehlers Danlos syndrome which as you know is the delightful multi-systemic condition with which my sons and I are diagnosed. 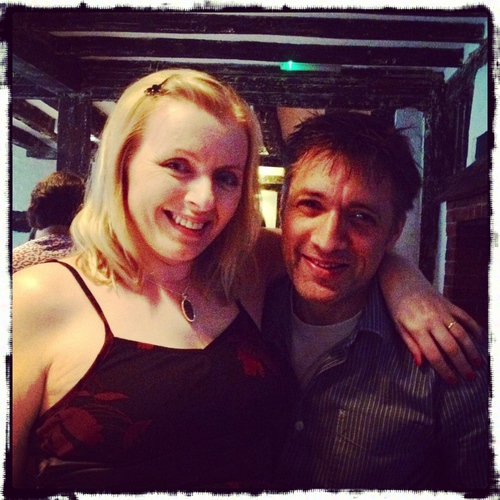 I managed to get through to my forties before I became very ill with EDS in December 2012. It followed a return to paid work which I threw myself into as well as managing Special Needs Jungle which had come into its own the same year. I might have got away with it if it wasn't for the fact I was also falling into the swirling vortex of an unexpected early menopause, again due to consequences of EDS. Looking back, I began to suffer the racing heart symptoms of PoTS before I'd started the job that March 2012, but I had shrugged it off, the same way I had just carried on my whole life up until then. At various stages I'd suffered with weak ankles, broken limbs, strange sharp pains that would come and go, dizzy spells, an inability to stand for long without back pain, pleurisy, gastro problems, fatigue, mysterious abdominal pains, a constantly stiff neck, frozen shoulder and even a slipped disc. On top of this was an intractable depression that started at 16 and has plagued me on and off ever since as well as other mental health difficulties. These are all symptoms of Ehlers Danlos syndrome, but dots had no chance of being connected - no one had ever heard of it. It was far more likely that you'd be diagnosed with a huge case of being a chronic hypochondriac. Because it was the 70s and I grew up in a single parent, working-class family, you just got on with things and I was out of the house more than I was in it. Maladies were dealt with matter-of-factly and a constant forward motion was encouraged. The standard refrain was, "You'll be alright when you get going." It serves to make you resilient but even the resilient have their limits for coping. Whizz forward a few decades and I twigged that Son2 was suffering from symptoms matching EDS, that I had discovered during a search of the Genetic Alliance UK website for Rare Disease Day. Of course I realised I had the same, but I was alright when I got going, as I had been taught so long ago. My GP had never heard of the condition, so I was able to give her some information from the support charity, EDS UK. I had also researched the options for consultants and discovered there were not only very few, but the wait was ginormous. We opted to pay for a private consultation with the pre-eminent specialist in EDS, Professor Rodney Grahame at The London Hypermobility Unit where he was diagnosed. Several months later, being alright when I got going just wasn't working and my own body metaphorically fell off a cliff from too much work, stress and too few hormones. I was also diagnosed privately by the Prof. The CQC-led Invisible Disabilities Week want to hear tales of our treatment experiences. For my son and I, they are vastly different. Son2 was referred back into the NHS at our request, and Prof Grahame recommended Dr Nelly Ninis, an extraordinary Paediatrician at St Mary's, London. Dr Ninis sees many children with EDS and sent Son2 for a 24-hour ECG and an echocardiogram on his heart. This is standard in EDS because of the possibility of mitral valve prolapse and abdominal aortic rupture if you have EDS IV. 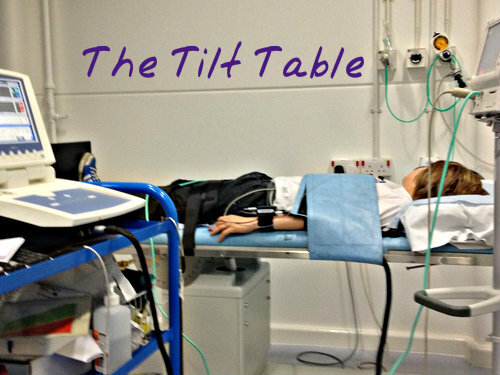 Because he also had suspected Postural Orthostatic Tachycardia (PoTS), he was given a Tilt-Table test where he was found to definitely have this condition too, which is very often seen as a part of EDS. Stretchy collagen means the blood vessels in the extremities do not respond quickly enough on a postural change, e.g. standing, and so blood drops to the feet. The heart then responds by racing to try to get blood back up to the head which makes you feel very dizzy or you can pass out completely. Son2 had his ECG and echo locally and it was apparent that the doctor we saw had little real understanding of EDS beyond the 'headline'. He also once kept us waiting for 45 minutes, by which time Son2 had become very 'Potsy' and thrown up and I was exhausted. I was not best pleased, as you can imagine. Dr Ninis recommended Hydrotherapy, but the local physio team were very nervous of his possibly fainting with the heat of the water. He was fine for most of the sessions and did benefit. However, the problem is, hydrotherapy is designed for short-term use with just six sessions, which just isn't sufficient for a long-term condition. It's also under-resourced and hard to find. 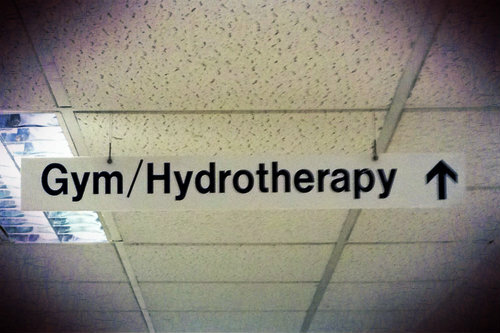 This is mad - hydro is an ideal gentle exercise that can help to transform the lives of people living with chronic pain, if only they could get it or even knew about it. Son2 also tried with local dry-side physio, but again we encountered the problem of a lack of understanding of EDS beyond what they might have read in a medical reference book. As Son2 also has Asperger's, he is also very sensitive to personalities and took an instant dislike to the bossy physio and her insistence that he give her a "grading" with a counter in a slot rated from Excellent down to Poor. He rightly pointed out that he felt he had to give her full marks as she was standing right next to him and so he declined to take part. We didn't go again. Dr Ninis, who is kind and compassionate and most of all understanding, sees him every three to six months, although it's an arduous journey to St Mary's from our home in Surrey. It means my husband needs to take the day off as my own EDS means the drive is impossible for me. As a contractor, this means the loss of a day's pay. My own experience has been much worse in many ways. After diagnosis, I too had to go back into the NHS as we can't afford to keep paying for something we already pay for through taxation. It was seven months before I saw the EDS consultant, Dr Hanna KazKaz at UCL. She referred me for the Stanmore hypermobility rehab course. The wait for a first visit for Stanmore assessment was over a year and then it was another eight months before I managed to get on the course. Shortly after I was accepted for the rehab, the list was temporarily closed due to the waiting times already being experienced. It's the only one in the country I believe, so it's hardly surprising they are overwhelmed. The wait for PoTs diagnosis was even longer. Again we paid for an initial appointment to see the eminent Professor Chris Mathias in May 2013 but the tests would cost £1800 so we waited to see his former NHS team, as he had retired from the NHS himself. The wait thereafter was interminable; a year for a consultation, another few months before the Tilt Table test and a further 10 months for the results of the tests. In retrospect, perhaps we should have paid for the whole lot privately, but hindsight is 20:20. For both Son2 and myself, every aspect of this has been driven by me, from the realisation of what the problem was to finding the consultants, to going back to the GP time and again to ask for other referrals. There is no joined up care, there is no creative thinking, there is little thought of the patient experience. Certainly not when the available doctors for the conditions are so few and far between and the waiting lists are so very long. Neither is there local coordinated long-term care. I understand GPs are generalists and very busy, but I would have hoped that when one family's members in the practice are diagnosed with the same complex, rare condition and the children also have autism, a more proactive approach might be taken. At least to read up on it a bit. It's no wonder so many cases of Ehlers Danlos go undiagnosed. Lucky for me that I'd had that "just get on with it" upbringing, because the pressure to cope with offspring with autism, EDS and PoTS as well as my own chronic pain is immense. Indeed, in the past I have cracked under the strain when that one thing comes along and causes overload. I have had to seek psychological help. but we won't even go into the debacle that the Mental Health service is, and continues to be. This may seem like a critical post, but it is only critical of the resources and the structures that prevent medical professionals giving the care patients need, particularly in the field of rare diseases. Long term health conditions have a psychological as well as a physical impact, even when there is no specific mental health problem. Feeling cared for and that your experience as a patient actually matters, is a huge part of that. It's all part of that joined-up experience that starts and finishes in the GP surgery as what should be the coordinating service. However, with a shortage of GPs and constant pressure to give more for less put on them by politicians, it is hard to see how this will improve. Perhaps the increase in patient participation boards may make this difference, as a reminder that a 'patient' is also a human being. The question, "Would this be good enough for your child or parent?" is the mantra everyone employed in caring services should recite every day.